I wanted to make a different raitha from the usual cucumber and tomato raitha that i usually make at a party. The idea for this recipe came from my friend D' who brought over this raitha for a lunch party. I really liked the flavours that the green pepper lent to the raitha. This is my version of D's recipe. 1. In a kadai take 2 tsp oil. Once it is hot add hing and mustard. 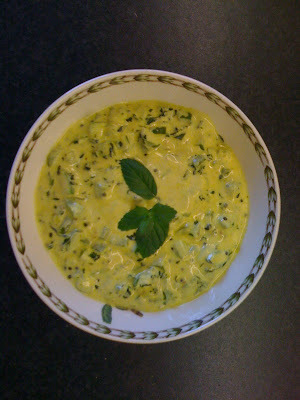 Once the mustard splutters, add the slit green chillies, chopped coriander and mint leaves. Fry for a minute or two. 2. Add the tumeric, diced green pepper and salt and fry till pepper turns soft. Let it cool. 3. Once cool add curds and pomegranate stir well. Serve chilled.